Dedicate the 28th (Thu) to wine at some of the top wineries in the area. And it doesn't end there: snap pictures at Ponte de Dom Luis I, don't miss a visit to Liberdade Square, get lost in a book at Livraria Lello, and steep yourself in history at Porto Cathedral (Se Catedral). For reviews, traveler tips, other places to visit, and other tourist information, use the Porto travel planner . Erechim, Brazil to Porto is an approximately 23.5-hour flight. The time zone difference when traveling from Erechim to Porto is 3 hours. In March, Porto is slightly colder than Erechim - with highs of 18°C and lows of 9°C. Wrap up your sightseeing on the 29th (Fri) to allow time to travel to Paris. 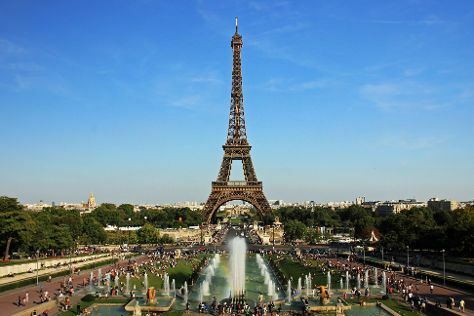 Paris is known for museums, historic sites, nightlife, parks, and shopping. Your plan includes some of its best attractions: admire all the interesting features of Eiffel Tower, get a taste of the local shopping with Le Marais, explore the world behind art at Centre National d'Art et de Culture George Pompidou, and walk around Luxembourg Gardens. To find traveler tips, maps, more things to do, and other tourist information, read Paris trip itinerary website . Getting from Porto to Paris by flight takes about 5.5 hours. Other options: do a combination of flight and shuttle; or drive. The time zone difference when traveling from Porto to Paris is 1 hour. Traveling from Porto in March, things will get slightly colder in Paris: highs are around 13°C and lows about 3°C. Finish your sightseeing early on the 1st (Mon) so you can travel to Prague. Prague is known for historic sites, nightlife, museums, fun & games, and zoos & aquariums. Your plan includes some of its best attractions: don't miss a visit to Old Town Square, wander the streets of Mala strana, admire the striking features of Prague Astronomical Clock, and take in panoramic vistas at Petrinska rozhledna. To find maps, where to stay, other places to visit, and tourist information, refer to the Prague vacation website . You can fly from Paris to Prague in 5 hours. Alternatively, you can do a combination of shuttle and flight; or drive. In April, plan for daily highs up to 17°C, and evening lows to 5°C. Cap off your sightseeing on the 4th (Thu) early enough to travel to Budapest. Budapest is known for historic sites, spas, nightlife, museums, and nature. Your plan includes some of its best attractions: get a sense of history and politics at Parliament, steep yourself in history at Liberty Statue, don't miss a visit to Fisherman's Bastion, and pause for some photo ops at Hősök tere. To find maps, other places to visit, more things to do, and other tourist information, read Budapest online trip planner . Fly from Prague to Budapest in 4.5 hours. Alternatively, you can drive; or take a bus. In April, daytime highs in Budapest are 20°C, while nighttime lows are 5°C. Finish up your sightseeing early on the 7th (Sun) so you can travel to Rome. Rome is known for historic sites, nightlife, museums, classes, and shopping. Your plan includes some of its best attractions: delve into the distant past at Colosseum, get to know the fascinating history of Piazza Navona, take in the spiritual surroundings of Vatican Museums, and wander the streets of Trastevere. To find traveler tips, ratings, reviews, and tourist information, you can read our Rome road trip planning site . Fly from Budapest to Rome in 5 hours. Alternatively, you can drive; or take a train. Plan for somewhat warmer temperatures traveling from Budapest in April, with highs in Rome at 24°C and lows at 11°C. Wrap up your sightseeing on the 11th (Thu) to allow time to travel back home.